This weather has been so fantastic this year that we seem to be cooking outside all the time! Burgers are often on the menu and these are a family fanourite! They have a few parts to them but are totally worth it! If you don't have time to make your own patty just a buy one and use the mayo and toppings - it'll still taste delicious! Place all ingredients in a bowl, and combine well. Form the patties for our burgers. I don’t measure for this – use as much of each ingredient as you like to your own taste! 1 cup or so of mayo - not the salad dressing type - use the Hellman's type mayo, not the Miracle Whip type - this is very important and it'll completely change the taste! Heirloom tomato (these can be expensive so just buy as many as you need – I usually only buy one large one for six burgers), sliced thickly. You will also need some fresh basil leaves, large ones, and some crusty Italian buns. Preheat your bar be cue and cook your patties. Toast your buns on the bar be cue too! To build your burgers, place your patty in the bun and top with fresh mozzarella, and then the tomato slices, topped with the fresh basil leaves. Sprinkle with salt and pepper. 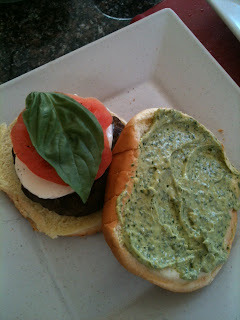 Top with the basil mayo and enjoy!